From The North: Take Route 95 South. Take Exit 6A (Route 495 South, Cape Cod). Take Exit 11 (Norton, Route 140 South. Go 2.8 miles to Traffic Lights (Intersection of Rt. 140 and Rt. 123). Take a left and 1st Right back on to Route 140 South(Taunton, New Bedford). Go 3/10 mile and at funeral home sign on Route 140, take a Left on to Clapp Street. The funeral home is 3 buildings down on the right. From The South: Take Route 95 North. Take Exit 6A (Route 495 South, Cape Cod). Take Exit 11 (Norton, Route 140 South. Go 2.8 miles to Traffic Lights (Intersection of Rt. 140 and Rt. 123). Take a left and 1st Right back on to Route 140 South(Taunton, New Bedford). Go 3/10 mile and at funeral home sign on Route 140, take a Left on to Clapp Street. The funeral home is 3 buildings down on the right. From The West: Take Route 495 South. Take Exit 11 (Norton, Route 140 South. Go 2.8 miles to Traffic Lights (Intersection of Rt. 140 and Rt. 123). Take a left and 1st Right back on to Route 140 South(Taunton, New Bedford). 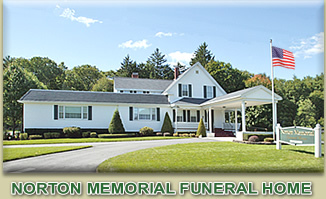 Go 3/10 mile and at funeral home sign on Route 140, take a Left on to Clapp Street. The funeral home is 3 buildings down on the right. From The East: Take Route 495 North. Take Exit 10 (Route 123 to Route 140, Norton, Easton). At end of ramptake a Left on to Route 123. Go 1.9 miles to traffic lights and take a Left on to Route 140 South. Go 3/10 mile and at funeral home sign on Route 140, take a Left on to Clapp Street. The funeral home is 3 buildings down on the right. Please Call 508-285-4402 If You Need Further Assistance.